This is the third game in the Lightning series. Fight the war on terror with America's cutting edge weapon systems! You have been charged with hunting down terrorists aiding regions around the world and toppling their corrupt governments. To accomplish this, you have been given command of the latest weapons and best personnel America has to offer. You get to command elements of the Air Force, Army, Navy, Marines, Special Forces and Propaganda Warfare. 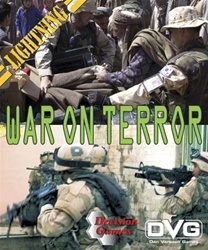 War on Terror is an ultra-low complexity card game for all ages. The focus is on fast card play, strategy, and fun interactive game play for 2-4 players. Includes 110 full color playing cards and one sheet of rules.